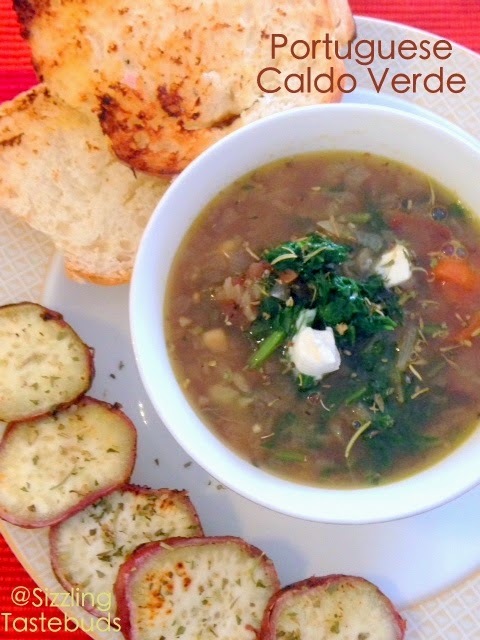 The basic traditional ingredients for caldo verde are potatoes, collard greens (although kale may be substituted), olive oil and salt. Additionally garlic or onion may be added. I substituted spinach in place of collard greens or Kale (both of which are either sparse or unavailable in India). The resultant soup was a light broth and went well with toasted French Bread and oven grilled sweet potato. Addition of cherry tomatoes (though not in the original recipe) added a dash of tang to the otherwise slightly bland soup. As I was making this for the elder girl, I didn't add too many green chilies but I think that would upped the spice factor manifold. Portugal is a unitary semi-presidential republic. It is located in South-Western Europe, on the Iberian Peninsula, and it is the westernmost country of mainland Europe, being bordered by the Atlantic Ocean to the west and south and by Spain to the north and east. Aside from continental Portugal, the Portuguese Republic holds sovereignty over the Atlantic archipelagos of Azores and Madeira, which are autonomous regions of Portugal. The country is named after its second largest city, Porto, whose name derives from Latin "Portus" and Celtic "Cale". So, today we are in Portugal as part of our 30 day World Blogging Marathon. In a saucepan, heat olive oil. Saute onions and garlic for 2 mins. Now add the spinach and wilt it a bit (about 2 -3 mins). Now add the cherry tomatoes, salt and let the tomatoes sweat a bit. Now add the peeled and cubed potatoes and saute for 4-6 mins. Once a little softened, add the vegetable stock, cover and simmer for 8-10 mins till potatoes are cooked and turn a bit mushy. Press one or two pieces to give it a little volume to the broth. Switch off the flame, and finish with pepper powder. Serve hot wit croutons or toasted bread. That's an interesting soup...very healthy! Delicious looking soup. Bookmarking the recipe. 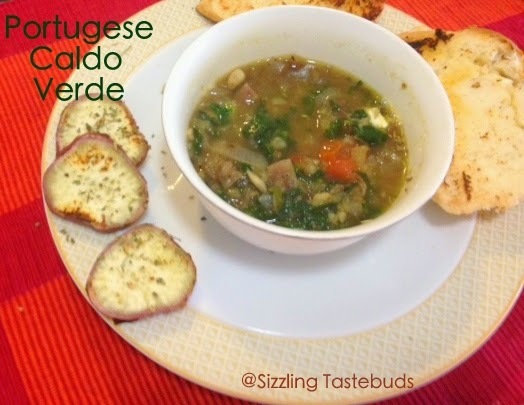 Nice soup for winter, healthy and filling. I had bookmarked it as well but remembered about the pierogis and changed it in the last minute! Lovely soup! 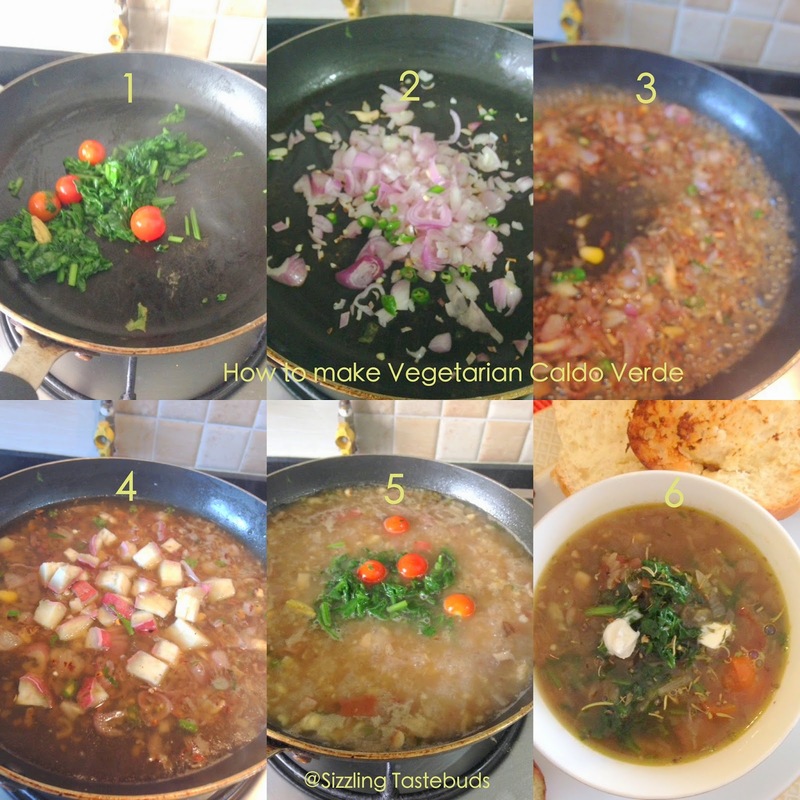 Prefect soup to have while the weather is chilled outside, looks healthy and hearty. Love the way you have presented it, I am not a soup person, but I like the ingredients in this soup and a good choice for the country. Another healthy & hearty soup. You are amazing me with an array of beautiful and delicious soups for this BM. This looks nice..